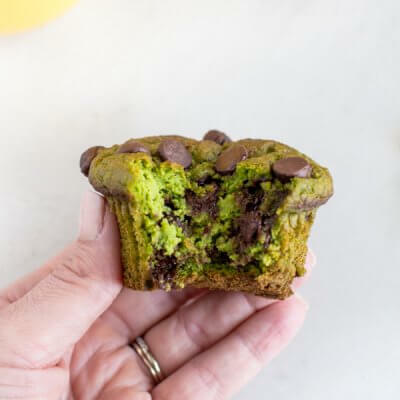 Healthy Spinach Breakfast Muffins are gluten free muffins made straight in the blender! No added sugar (minus the chocolate chips) only the sweetness from naturally occurring sugars in Florida Orange Juice. Your little ones will love this spinach muffin recipe. Preheat oven to 400 degrees F. Line 12- count muffin pan with high quality muffin liners. We used jumbo foil muffin liners for best results. In a blender, add Florida Orange Juice, spinach, apple sauce, oil and vanilla and blend until spinach is fully pureed. Add oats, almond flour, flaxseed, baking powder, baking soda, and salt to mixture in blender and pulse until fully mixed, scraping down sides of blender as needed. Add eggs and pulse quickly, just until incorporated; taking care not to over-mix. Stir in chocolate chips and pour muffin batter evenly into 12 muffin cups. Top with additional chocolate chips if desired; bake in oven for 25 minutes. Once removed from oven, allow muffins to rest in pan for 5 minutes before transferring to wire drying rack to fully cool before enjoying. Use high quality jumbo foil liners for best results. Please allow for muffins to cool completely before removing liners to prevent sticking. Grain free muffins need to be fully cooled before enjoying for best texture.